The Lincoln Stars went 0-2-1 in three games over the long Thanksgiving weekend with regulation losses to Sioux City and Des Moines, and an overtime shootout loss to Cedar Rapids. The losses dropped Lincoln record to 5-9-3 (13 points) on the season. The Stars are in seventh place in the USHL western conference, one point ahead of the Waterloo Blackhawks who have lost 9 straight games. I'm going to quickly recap each game below. Instead of individual articles for each game I thought I'd combine all three games into one recap article. In what was their best effort over the long weekend, the Stars outplayed the top team in the USHL for 60 minutes but came up short in the shootout. Dominick Sacco got the Stars on the scoreboard very early in this game to give his team a 1-0 lead and pump up the fans in attendance. However, the Roughriders exploded for three straight goals in the remaining minutes of the first period to take a 3-1 lead into the first intermission. All three CR goals (one was shorthanded) were on breakaways. Despite the score, I really thought the Stars played well in that first period. They made a few mistakes that Cedar Rapids converted into goals. The Roughriders took full advantage of the few offensive chances they had in the period, but otherwise I thought Lincoln was the better team. Down 3-1 to the top team in the USHL, the Stars could have easily rolled over on their backs and let the Roughriders rack up even more goals, but Lincoln didn't quit. Stars goaltender Peyton Jones and his teammates shut the door on the potent Roughriders offense the rest of the game, while Michael Gillespie scored once in the second period and once in the third period to knot the score at 3-3 after sixty minutes. Neither team scored in the overtime period so this game was decided by a skills competition (shootout). The only goal scored in the shootout came from the Roughriders which gave them the two points and the 4-3 victory. Shots were 26-23 in favor of Cedar Rapids. Stars goaltender Peyton Jones stopped 23 of 26 and 2 of 3 in the shootout. Lincoln went 1-for-4 on the powerplay while the Roughriders went 0-for-6. Credit the Lincoln penalty kill unit for keeping the Stars in this game. Cedar Rapids had one of the top powerplay units in the league, and the Stars put a blanket on them all game long. Considering how well the Stars played against the top team in the league, I had hopes they would ride that momentum and play even better against Sioux City and Des Moines. Unfortunately, that didn't happen. For the first time this season, the Stars were shutout as the Musketeers blanked the Stars in Sioux City, IA by a score of 3-0. I'm not sure I want to devote a lot of time to this particular recap. It wasn't an enjoyable experience to watch it on FASTHockey. Mentally (and physically), I'm not sure the Stars ever got off the bus. It was ugly. The only positive was the play of goaltender Cam Hackett, who stopped 37 of 39 shots in the loss. You can't ask more from your goaltender on the road than what Cam provided. He just didn't get any help. The Muskies got out to a 2-0 lead in the first period, and outshot the Stars 17-5. In fact, the Muskies outshot Lincoln 31-8 through the first two periods. SC scored a meaningless empty-net goal to round out the scoring very late in the third period. The final shot total was 40-20 in favor of SC. From my viewing on FASTHockey, I think the off-ice officials in Sioux City were generous in giving Lincoln 20 shots on goal. Anyway, the shutout loss was certainly a letdown compared to the way the played the night before against Cedar Rapids. The Stars snatched defeat from the jaws of victory Saturday night as the Des Moines Buccaneers scored two late powerplay goals to come from behind and beat Lincoln by a score of 3-2 at the IceBox. For the most part, I thought Lincoln played pretty well the first half of this game, but seemed to tire as the game went on. Like the Omaha game last Friday at the IceBox, I thought the bigger, more physical Bucs wore down Lincoln, which showed in the third period. Max Humitz gave the Stars a 1-0 lead very late in the first period, and at the time it seemed like the Stars would take the lead into the first intermission. However, the Bucs scored a powerplay goal with only 2.6 seconds remaining to take the wind out of the Stars' sail and knot the game at 1-1 going into the first intermission. After a scoreless second period, Patrick Polino opened the scoring in the third period with a shorthanded tally which gave Lincoln a 2-1 lead with roughly 14 minutes remaining in the game. The IceBox exploded. The Stars had all the momentum on their side, and from my seat, I really thought the team would rally together and hold off the Bucs. However, a careless double-minor penalty for high-sticking was called on Lincoln's Joe Lappin at the 10:36 mark of the third period was the beginning of the unraveling. Bucs forward Tanner Karty scored two powerplay goals during the ensuing four-minute penalty to Lappin to give the Bucs all that they would need to escape the IceBox with two points. As good as Lincoln's penalty kill unit had looked the last home game against Cedar Rapids, it looked just as bad against Des Moines. Special teams woes continue to haunt the Stars. The Bucs went 3-for-7 on the powerplay, while the Stars went 0-for-2. For the most part, the Stars have cleaned up the undisciplined stick-related penalties that we saw a lot of the past couple of seasons, but they were front and center Saturday night, unfortunately. Stars goaltender stopped 35 of 38 shots in the loss. Again, I'm not sure you can ask for more from your goaltender than what Cam provided in these past two games. He stopped 72 of 77 shots on goal (.935 save percentage) in the two regulation losses to Sioux City and Des Moines. The long weekend started off pretty well with the Stars playing an inspired, 60-minute effort against Cedar Rapids, but it ended with a thud with the shutout loss to Sioux City and the third period collapse against Des Moines. Sorry for the abbreviated recaps of these three games. I wanted to take full advantage of the long weekend and spend as much time as possible with family. 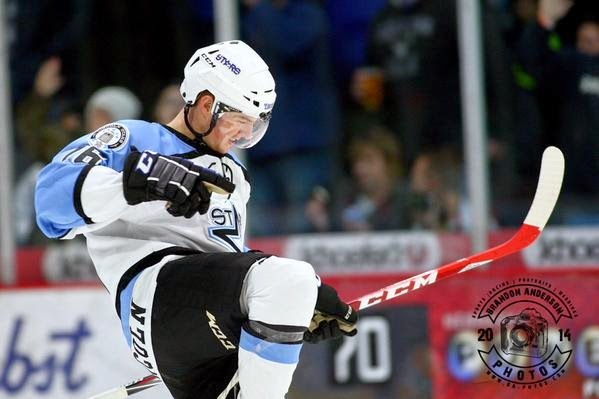 The Stars will be back in action this upcoming weekend with a Friday night home tilt against the Sioux City Musketeers, and a Saturday road game against the Omaha Lancers. This team has to start shooting. Everyone seems to be looking for the next pass when they have a wide open shot. Don't be afraid to let then rip boys!